This book focuses on installing, configuring and optimizing Nessus, which is a remote security scanner for Linux, BSD, Solaris, and other Unices. It is plug-in-based, has a GTK interface, and performs over 1200 remote security checks. It allows for reports to be generated in HTML, XML, LaTeX, and ASCII text, and suggests solutions for security problems. As with many open source programs, Nessus is incredibly popular, incredibly powerful, and incredibly under-documented. There are many Web sites (including nessus.org) where thousands of users congregate to share tips, tricks, and hints, yet no single, comprehensive resource exists. This book, written by Nessus lead developers, will document all facets of deploying Nessus on a production network. Nessus is the premier Open Source vulnerability assessment tool, and was recently voted the "most popular" open source security tool of any kind. 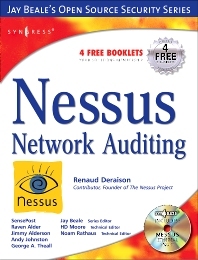 This is the first book available on Nessus and it is written by the world's premier Nessus developers led by the creator of Nessus, Renaud Deraison. The dramatic success of Syngress' SNORT 2.0 INTRUSION DETECTION clearly illustrates the strong demand for books that offer comprehensive documentation of Open Source security tools that are otherwise Undocumented. Network Administrators and Security Specialists running Nessus, a security scanner that remotely audits a given network and determine whether it is subject to being cracked or otherwise compromised. Why Do You Want to Write (and Publish) Your Own NASL Scripts?